Maria Ines Apolo D.P.M. is an attentive and mindful podiatrist practicing in the city of Coral Gables, FL. 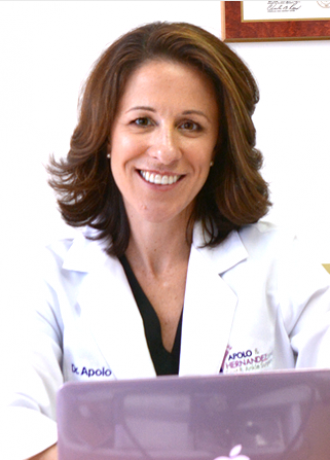 Dr. Apolo attended Barry University, where she received her podiatric degree and completed her primary podiatric residency and surgical podiatric residency at Westchester General hospital. Dr. Apolo is part of Apolo & Hernandez Foot & Ankle Surgery, where she leads the wound care, infectious disease, and pediatric practice. She treats patients for a variety of reasons including foot pain, athlete’s foot, gout, dermatology and planter fasciitis. Her areas of surgical focus are limb salvage and wound care. Dr. Apolo welcomes patients who require 1st and 2nd opinions. She is committed to helping patients receive the best treatment possible to achieve a positive and fulfilling lifestyle. Dr. Apolo enjoys spending time with her husband Mike and two children Sophia and Jacob. She is an amateur paddleboard racer; self-proclaimed pilates student for life, avid runner who participate in various local marathons and fashionista. She is of Uruguay decent and loves to be a local ambassador. She is also Coral Gables resident and enjoys spending time supporting her community.